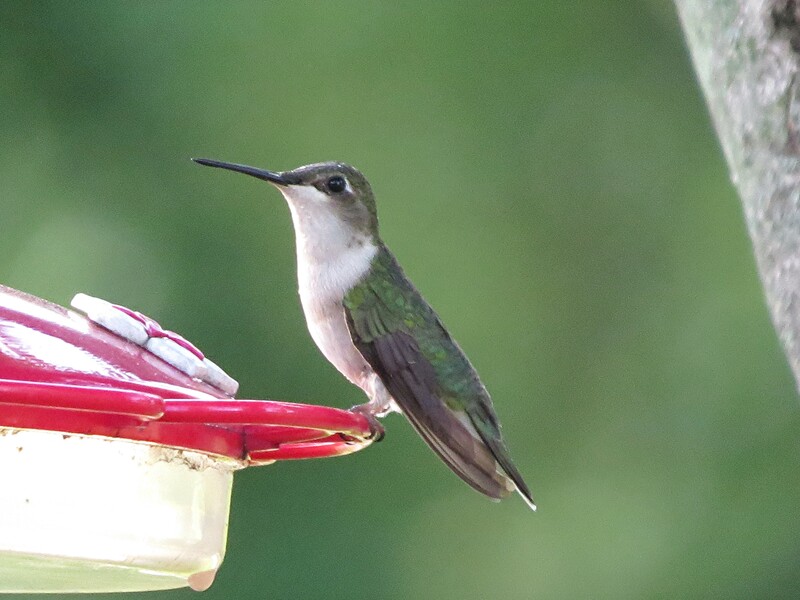 There will come a time when I’ll get a good photo of this elusive Summertime visitor. And with one full weekend left I’m still planning on going out and padding this total of 103 birds. 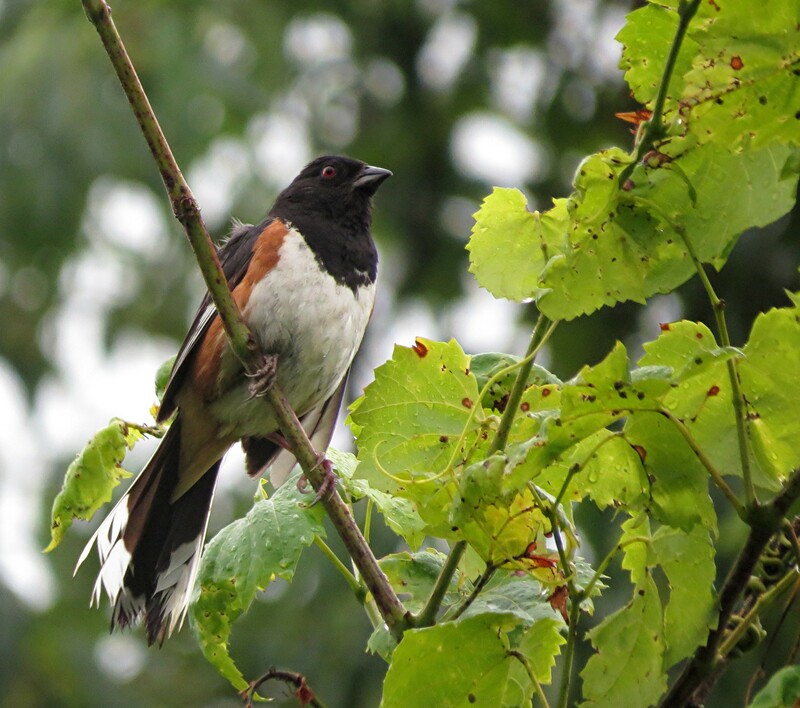 Even if I excluded the 3 species that were specific to the Great Smoky Mountains, those being the Swainson’s Warbler, Dark-eyed Junco, and the Black-throated Blue Warbler, I’d still have 100 birds. Challenge complete. 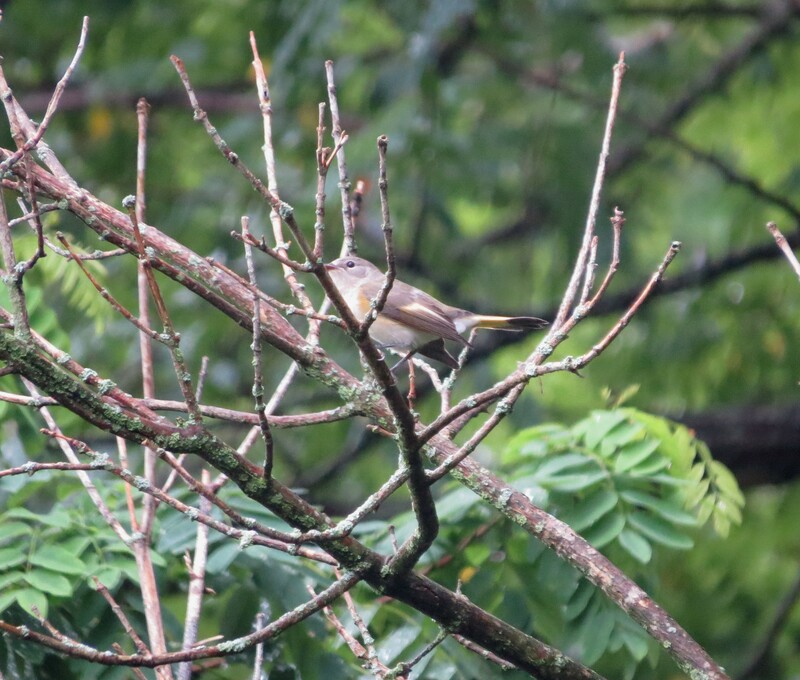 However there are still a few more warbler species that I’ll try to pick up probably this Sunday at Shawnee Lookout. So stayed tuned for yet another update. 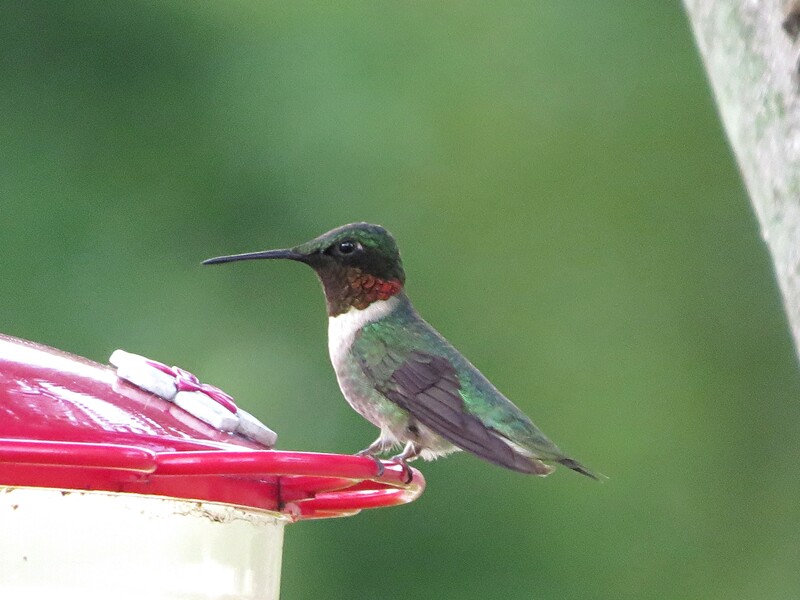 Since the purchase of my new camera, and the return of the Ruby-throated Hummingbirds, I’ve spent countless hours patiently watching and waiting for some good photo-ops of these birds. I’ve gotten some good one, and I’ve also taken crap. It’s something about fast moving objects that make getting a clear picture difficult. And to capture one as they’re hovering, and stopping the wing beats with a fast shutter speed is ridiculously hard. So for now I’ll settle for some stationary hummers. Today’s morning field trip had the sole purpose of bulking up my meager list as July slowly slips away. So with just 12 days to go I had to come up with a serious strategy so I could get the most birds while visiting the fewest places. I first had to write down what summer residents are still here and where is the best place to see them. With what was still needed to complete my July list, there was no doubt where I needed to go this morning. Spring Valley and Caesar Creek. 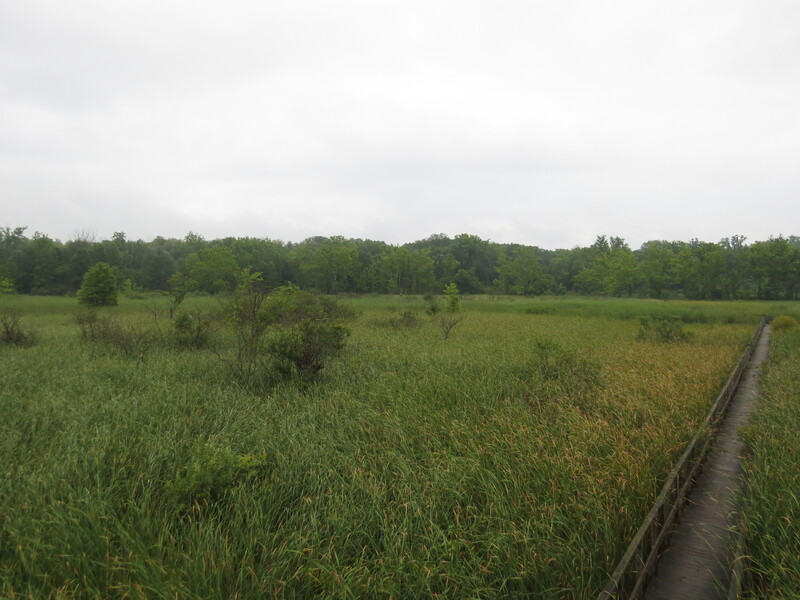 Spring Valley for Rails and Warblers and Caesar Creek for Gulls and Raptors. I arrived about 7:30 at the boardwalk at Spring Valley. It had rained the night before so the hike down the trail was a slick mess compounded with ruts left by some vehicle. The boardwalk was as slick as the trail, what with it covered with dew and a slimy coating of some type of mold. 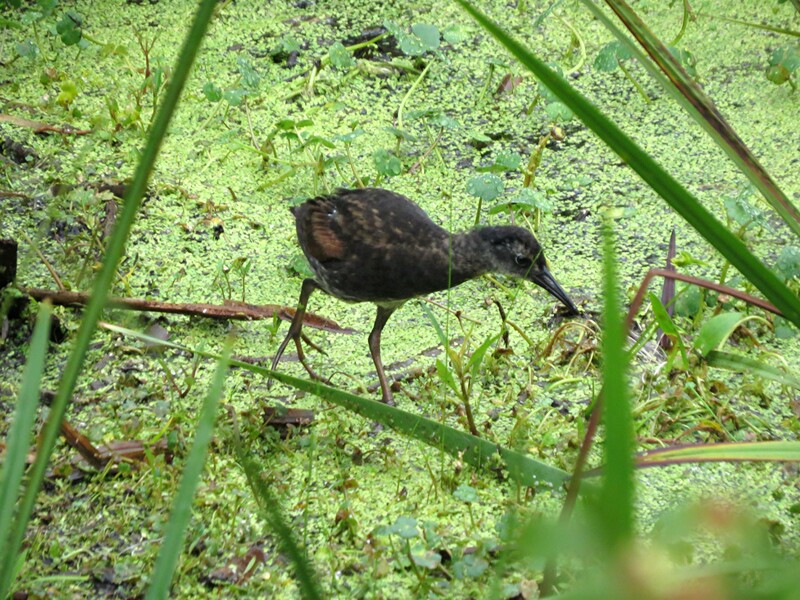 My focus was on Virginia Rails, Soras and Marsh Wrens, which all three can be either seen or heard from the boardwalk. 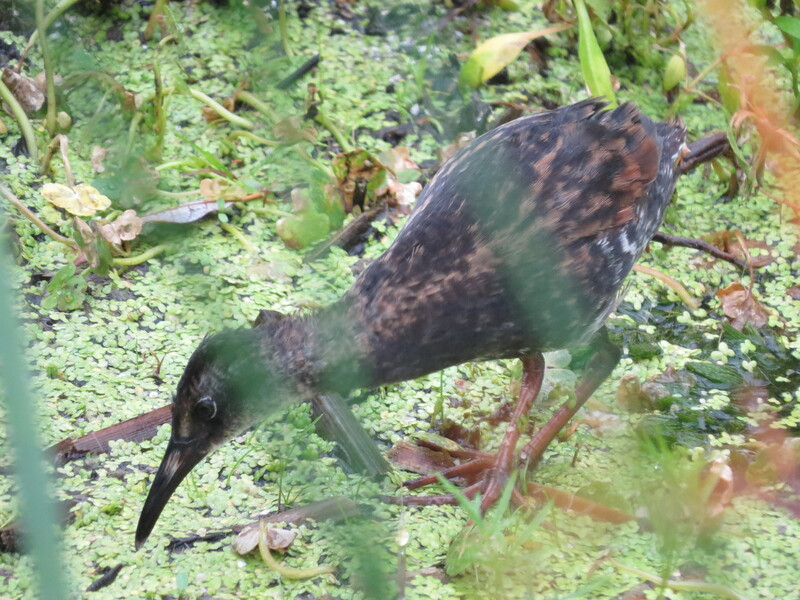 The secretive and reclusive Virginia Rail has been seen with some juveniles earlier this week so I know they’re here. It’s just finding them. I make my way to the observation tower and listen intently for any of these 3 birds calling. Looking towards the lake in the distance. Which at the time is choked with water lilies. I’m striking out! I’m not hearing my target birds, let alone see them. So I climb down from the tower and make my way back to my favorite spot along the boardwalk. There’s an open area about 50 feet before you get to the tower which in the past has proven to be the go-to spot for Rails. 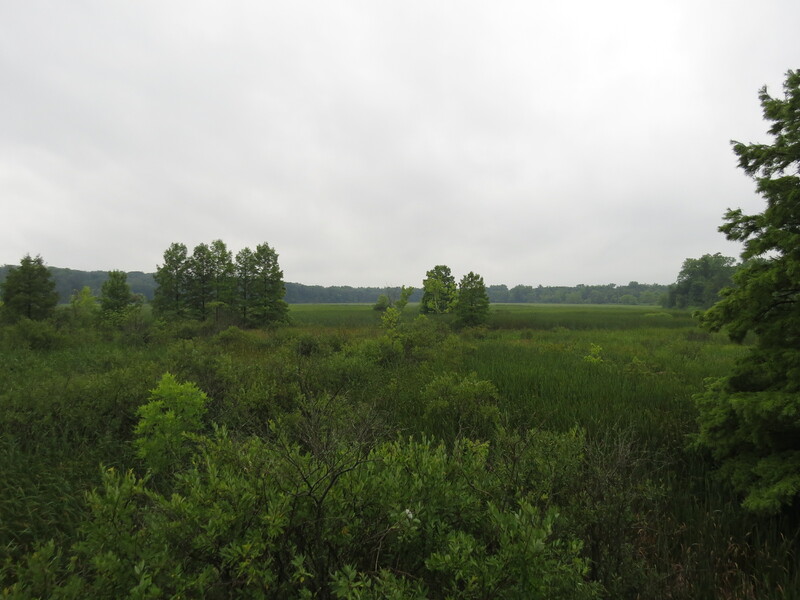 It doesn’t look like much of an opening, but if your going to get a clear view of either a Sora or a Virginia Rail, this is the place. Then I see movement as I approach the clearing. 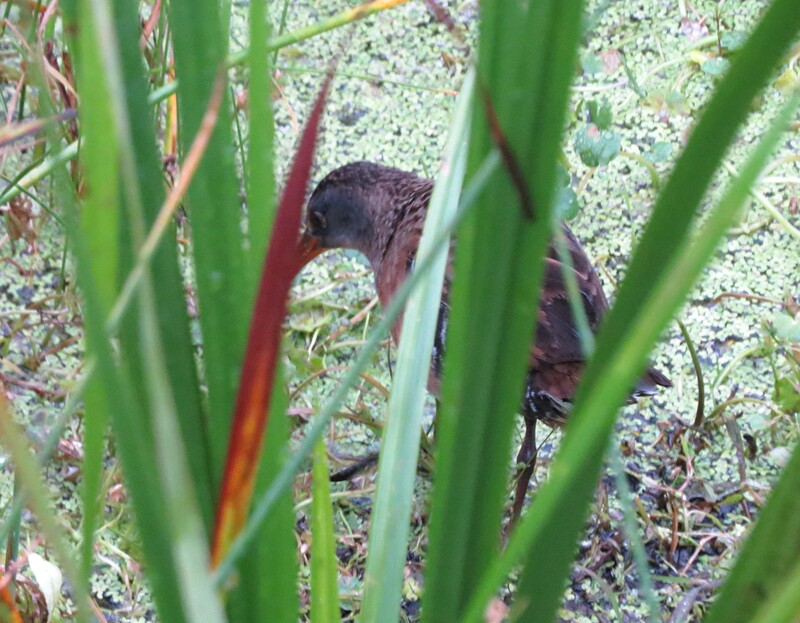 It’s an adult Virginia Rail. 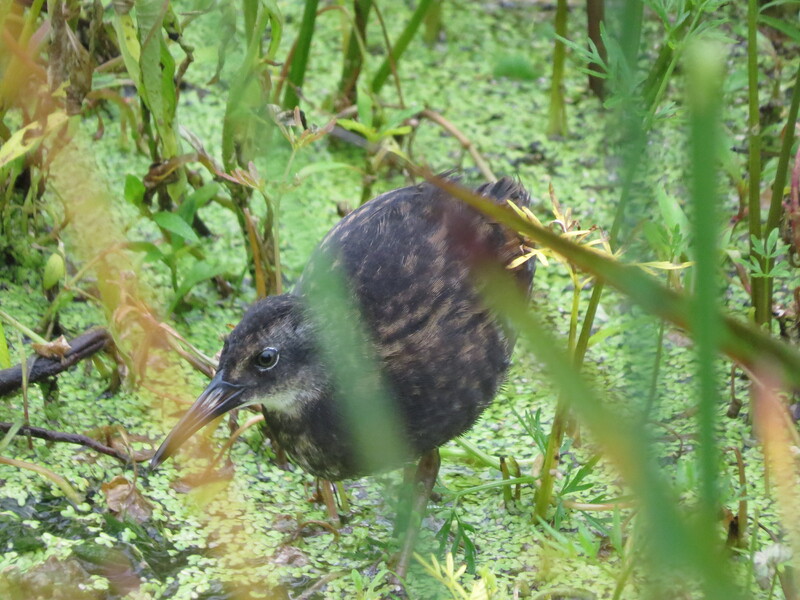 Then I notice behind the adult, coming out of the tall grass a juvenile. HOLY COW! 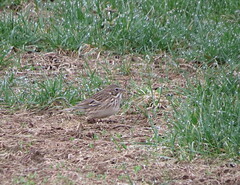 The camera wanted to focus on the grass in front of the birds, not the birds. It was very frustrating. However there’s my proof. So for an hour I jockeys around trying to get pictures as the juveniles cooperated with getting their pictures taken, while the adult keep a little more secluded. This was the best I could do at capturing the adult. 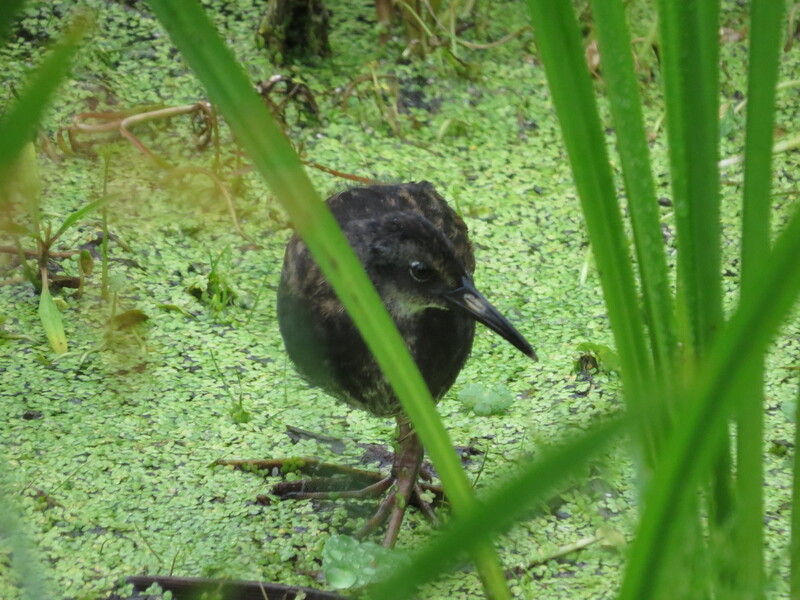 The juvenile skulking through the marsh. 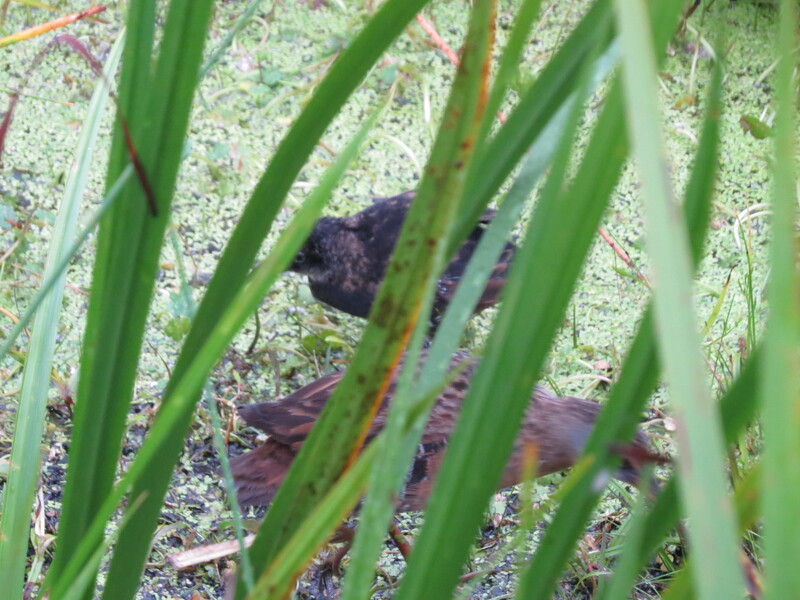 After this very successful sighting of these beautiful Virginia Rails, I climbed back up the trail to my car to head over to the lake side of the preserve and begin my hike on the Loveland Bike Trail. It’s from this trail where I know I can find a Bald Eagle and tick off another bird. 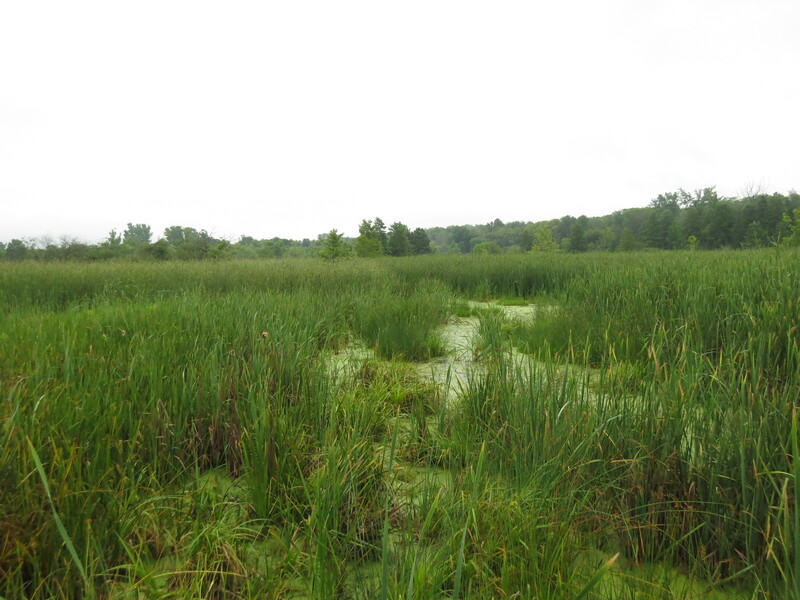 There are some marshy areas that run along the side of the bike trail which is popular with Prothonotary Warbler and Soras. Tick off a few more species. The morning was waning and I needed to get to Caesar Creek. I didn’t have much time so Harverysburg Road was my go to spot to see if I could tick off any more birds. With boaters on the water there was no birds on the lake. However I was able to tick off Osprey that was fishing and Ring-billed Gull, which are always here. How before I went to the Harveysburg Road overlook I stopped at the Mounds Road portion of the lake to see if any mud flat habitat has formed. So as I walked towards the lake I spooked 10 to 12 Great Blue Herons. So as I set up my spotting scope closer to the water, I scanned the sky in the direction of the Herons as they flew away. However one of the birds that was flying wasn’t a Great Blue. It was a Sandhill Crane. A little early for them and definitely an unusual sighting. Sorry no picture. But the good news is that I added some good birds for the day. That leaves me with a total of 92 birds for July. Despite the inclement at the time I left the house, I was hoping for a break in the rain as I made my way to Gilmore to pad my July 100 list this evening. I was hoping to add just a couple new birds for the month and with the news of breeding Great Egrets at Gilmore Ponds I naturally thought this place is so much more closer than the Oxbow, that I might as well give it a try. Tomorrow I’m off to Spring Valley and Caesar Creek. Time is ticking and it’s the 18th already. 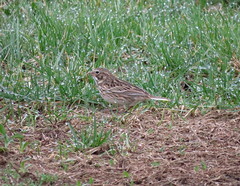 Most everyone who birdwatches has heard of the January 100 Species Challenge. Well the gauntlet has been thrown down again, and this time it’s a July challenge. July is one of those months when birding falls off. It’s still too early for migrants to be coming south, and it’s just too hot sometimes to be going out except in the morning. 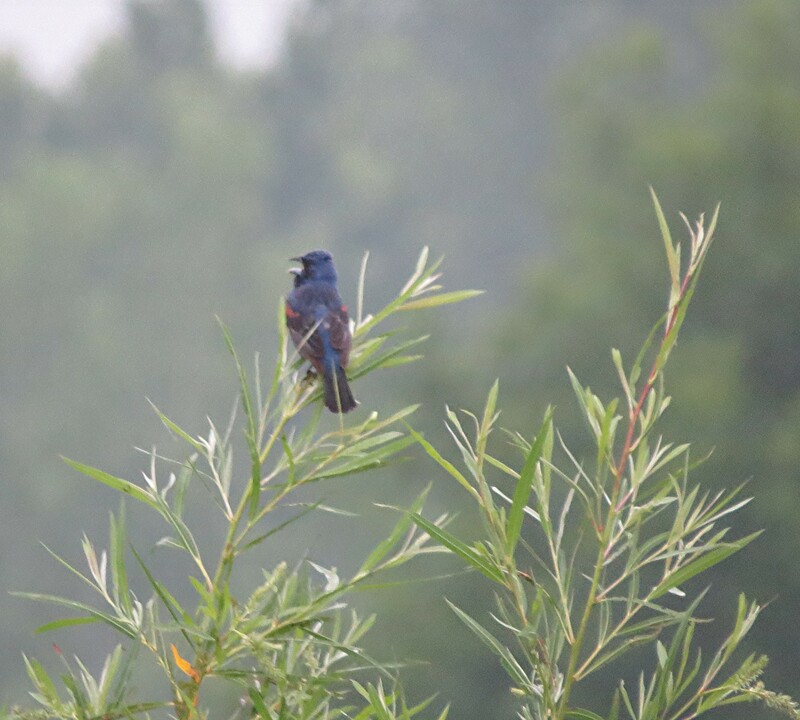 eBird has created their own challenge where if you submit 50 check lists for the month of July you”re eligible for a drawing where you could win a pair of nice Zeiss binoculars. 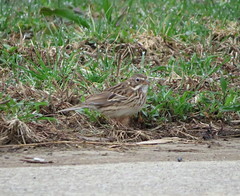 It’s seems that it’s not just Ohio where birding can be slow for the month. 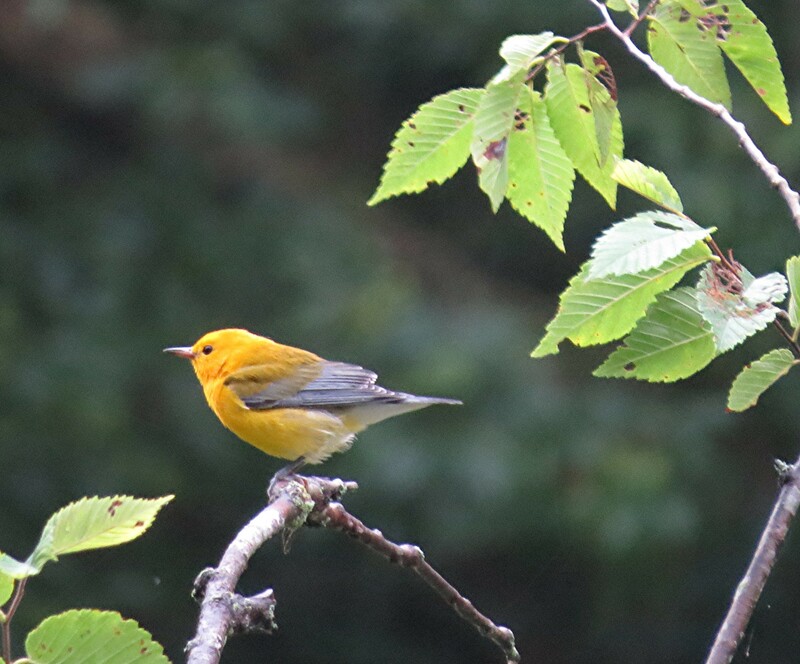 So earlier in the month Paul Hurtado, an important birder in the Ohio birding community, posted on the Ohio Listserv the challenge to come up with 100 species for the month of July. Well at the time I never gave it too much thought till recently. So I started to count in my head all the birds that I”ve seen this month, and I think that I have a good start to meet this challenge and maybe accomplish it. So this evening I sat down and compiled my list of all the bird species I saw this month. Now granted I did go to Tennessee over the 4th of July, and technically they ‘re still different bird species. So I’m counting them. After doing some careful counting I came up with 74 species so far. Which isn’t too bad, but can be improved upon. Now I’m thinking of my strategy on how to complete my list before August arrives. In a day or so I”ll share with you all the birds I”ve seen so far. So stay tuned.